My fave season is back-to-school season because it meant going to the bookstores to buy school supplies like notebooks, art supplies, etc. I no longer go to school (except for the occasional language classes and workshops) but back-to-school season still excites me majorly. I love seeing school/office supplies, organizational tools and stationery goodies and there’s always a great chance that there are new innovative items. I’ve mentioned in my previous posts how my fave SM section is the stationery department and I was raring to check out the area and maybe hoard haha. The nearest SM branch to me was SM Makati so I went there and immediately targeted the Stationery section. I was looking forward to hoarding pens and notebooks for my art journaling but boy oh boy I got pleasantly surprised when I entered the area. So many cute and colorful (and useful!) items! They have all the school supplies you need and they are well-stocked in every section. From pens to notebooks and paper to coloring materials to bags and organizers, everything you need for school/work can be found here. I love how they have so many options for each category. I’ve snapped some photos of items I particularly fell in love with. Here you can find Martha Stewart (!) punchers and craft materials, pretty notebooks and lots of paper and washi tape. There’s also paper with lovely designs that you can use for scrapbooking or wrapping your notebooks with. When I was studying I had very inexpensive spiral notebooks for school and to make it cuter I covered it with magazine pages I liked and replaced the metal spiral binding with yarn. But I bet this paper would also work and if you wrap your notebooks with it, they’d have a theme! In other news, I treated myself to a leuchtturm 1917 notebook because I’ve bee caressing this one each time I see it. I believe the “free engraving” was the perfect excuse for me to splurge, and so I got one. No regrets!! I’ve been cleaning our unit and found some items I previously hoarded to my delight: brushes, pens and pencils! I also found some stationery and stamps that I’ll be giving to daughters of my officemates. I realized that I have to curb my hoarding enthusiasm, so I snapped some photos to help me remember that I have more than enough (thanks, Universe!). I just uttered this wish to have said materials in my head, and lo and behold, friends and relatives and friends of relatives started to give me their pre-loved art materials, so that I could use them, they said. A few months ago, we were blessed with a fantastic opportunity, which we immediately grabbed. This blessing would mean we’d have to move and we accepted that with giddy hearts. We’re not yet truly done with the whole moving shebang, but I couldn’t resist decorating the new place even when it’s not the top priority–eep! The previous tenants used extra-strong double-sided tape in affixing stuff to the wall, so there are some unsightly adhesive spots. Since I had to cover these spots, I stuck some of my artworks and art/snailmail that I received from awesome people to the walls using my ever-favorite washi tape. I’m happy about the numerous white walls I can affix stuff to and our bookshelf! I’ve always wanted a tall bookshelf with a glass panel so that it won’t be too dusty (asthmatic problems hehe) and hard to clean, and so that I can admire them books–my preciousssessss. But! We’ve also invested in some under-the-bed storage boxes and filled four (!!) of them with books and magazines. We’ve also converted some cabinets that should be for shoes into bookshelves, cause for me and my partner, books trump shoes. Our former home didn’t have an elevator, so it was quite a challenge moving with these babies. These are only half of what I’ve decided I couldn’t part with. I’m a morning person and I love the sun. However, the afternoon glare is a bit too wild in this new place. I didn’t like the flimsy white curtains sold at the mall, and couldn’t find dainty lace ones (any leads?). The thick white ones were too pricey. Good thing I was able to buy a fabric shower curtain that had this nice metallic gold and white pattern in one side, and silver and white in the back side. I wasn’t able to buy curtain hooks so I made do with what I had, and used safety pins. Success! I want to hoard those shower curtains, but the one I saw seemed to be the last piece. Heh. I like the designs of Cath Kidston so I used my pretty floral mint green and pink washi tape and used it to decorate the cabinets. I’m happy I got over my fear of using the pricey washi tapes and realized how life quickly changes and how each day should be filled with things that make you happy. So go on and use that nice perfume before it evaporates, dress up (you never know what possibilities await you! ), go wild with your expensive art supplies and make beautiful art, or make a mess–just use it now if it gives you joy. 🙂 Have fun creating! Art Friend has arts and crafts materials–I spent around an hour or more just browsing through the wares. So many choices! Hi! 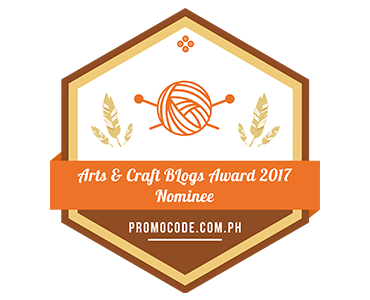 I'm Drea Dela Cruz, an artist/crafter from Manila, Philippines. I love trying new things related to arts and crafts and experimenting with various materials. I started this blog because I wanted to share my love for the DIY movement--I believe everyone has that artistic side that makes them unique and special and I support encouraging fellow makers. Keep on making things! Aside from arts and crafts, I also enjoy reading books and magazines, playing with stray cats, traveling, and eating. I'd love to share my artsy-craftsy adventures and journey with you here! If you wanna get in touch with me, kindly email: mabuhaydiy@gmail.com. P.S. If you want free creative prompts and updates on my upcoming workshops/pop-ups, join my mailing list here: tinyletter.com/mabuhaydiy. Tips, Tricks, and Techniques: Papercutting!